March 27, 2019 – Stopping the planter to make sure your seeding depth is spot-on is one of the least expensive, yet most important management practices to start the season strong. Hear other planting tips from Golden Harvest Agronomist Rich Lee. 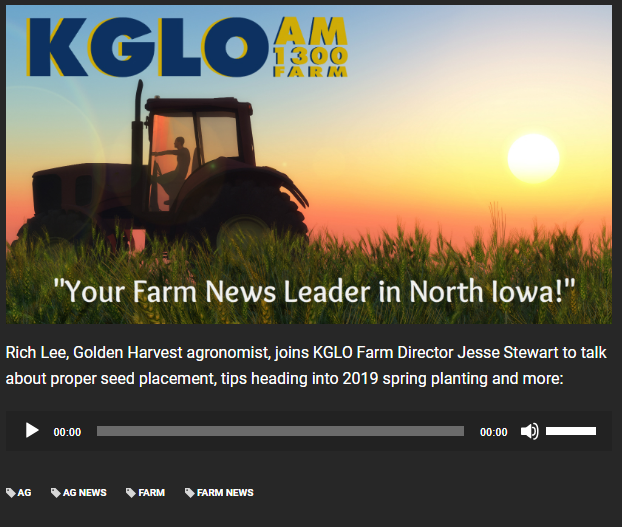 Source: Jesse Stewart – Farm Director – KGLO-AM 1300 in Mason City, IA. https://www.kgloam.com/talking-proper-seed-placement-and-agronomy-with-golden-harvest/ KGLO-AM 1300 (Mason City, IA) is owned by Alpha Media, a diverse multimedia company sharing music, sports, news and agriculture across a variety of platforms. Learn more at http://www.kglonews.com/.